Homemade cookies are the perfect dessert. They are small, warm, and satisfying. They can be square and lumpy or round and smooth. And the best part is, it's very, very hard to screw them up. If you have a good recipe, measure the ingredients out fairly accurately, and take them out of the oven before they burn, you can usually end up with a few dozen of these yummy little treats. And let's not even mention the thousands of different kinds of cookies, giving everyone ample opportunity to choose a favorite. Personally, I've always favored chocolate chip. But then I discovered this little recipe...and, yes, these are now my favorite cookie of all time. Boil raisins. Cream together shortening and sugar. Add egg, soda, baking powder, salt, and raisin juice. Drain raisins and add them to the mix. Mix in oatmeal, flour, vanilla, and nuts. Drop by teaspoonfuls onto a greased cookie sheet. Bake at 375 degrees until tops are slightly brown. These are really good if you let them stay just a little bit doughy inside. But let them cool for about two minutes before taking them off the pan. If you have a fancy cooling rack, hurrah! Otherwise, wax paper on a flat surface works totally fine. Now, the fun part of baking these cookies is that you can be as creative as you want. You can replace the water with orange juice and throw in some dried cranberries. You can just use warm water and add chocolate chips to the batter. Add a tablespoon of cinnamon and a sprinkle of nutmeg. Maybe a 1/4 teaspoon of ground cloves for a more seasonal autumn taste. 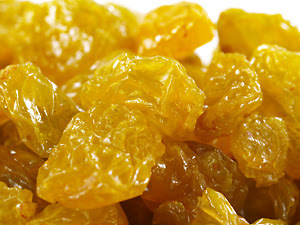 Replace the raisins with chopped dried apricots, cherries, or apples. Personally, I like to stick with tradition, but I insist on using golden raisins. They have a better flavor and texture, and more importantly, they tend to thwart those whiners who always say, "I hate raisins," with their crafty ability to blend in with the batter. I don't particularly like nuts in this kind of cookie, but if you are a fan of nuts, don't be afraid to be all crazy and throw in slivered almonds or chopped pistachios instead of the usual pecans or walnuts. Try a different extract flavor; almond or orange instead of vanilla. Use your intuition and experiment with different flavors. And if you are concerned about trans fats, just use two sticks of softened unsalted butter instead of shortening. Share with everyone you know and you won't have to worry about scarfing down all the leftovers by yourself. With this particular recipe, I would stick with the smaller size because 1) these don't really expand while baking, and the centers would never cook and 2) I usually eat 1/2 of them anyway. Furthermore, if I brought cookies instead of bagels on bagel day, I would fear beheading. People are very, very particular. Why Don't You Love Bread Like Bread Loves You? The Power of Bread Pudding! Say AMEN!